Swaroop Nair from Coimbatore needed Rs. 2 lakhs to add inventory to his saree shop. But the 33-year old was denied a loan because of poor credit standing. He hadn’t borrowed before and hence his credit score wasn’t strong. Swaroop is just one of the many people who wish to stand up in life but is bogged down by the strict lending protocols of the traditional banking system. Digital lenders seek to penetrate to the heart of India – the small towns and rural centres where banking has not yet made an impact. It is here that people like Swaroop get easy access to unsecured loans without worrying about credit scores. Its massive potential can be gauged from estimates that peg the digital lending industry to be worth $100 billion by 2023. India has 60 million MSMEs (annual turnover of less than 250 crores). However, their contribution to the country’s GDP is far lesser than other nations like the US or China. A primary reason is stagnating growth brought about by lack of access to credit in a timely and adequate manner. This leads to a huge market opportunity to the alternate lenders who wish to serve these customers better. With the help of non-traditional credit profile, they expand the outreach of tailored financial products that reach MSME business owner, right when they need it the most. With the phenomenal traction they have been receiving, these agile lenders have moved to wider areas such as student loans and real estate loans, and even wedding loans. As opposed to cumbersome credit profiling, the new age digital lenders are looking at alternative demographic and financial data. This helps them to determine creditworthiness to people who don’t typically use traditional banking avenues routinely. Such sleek digital lending not only helps in quick disbursement but also offers tailored products like wedding loans – a highlight that is sorely missing in the traditional banks. Digital lending started off as an alternative to the offline banking experience. Until a decade ago, digital lending was only restricted to automating manual processes. The narrow focus meant that they simply replicated the offline banking experience, which in turn, brought down the level of customer satisfaction. This is why, in the present times, informal MSME lending is going through an evolutionary disruption. These are combined with traditional sources like CIBIL scores to help applicants move successfully from banks to alternative lenders. Since its evolution, this trend has been the primary driver of this sector’s growth. However, with approaching maturity levels, innovators need to re-think the existing digital lending processes. New age lenders are integrating new data sources and re-imagining the loan origination avenues. They are experimenting a lot with enhancing end-to-end customer experiences with newer processes. Today’s digital customer needs only that information which is relevant to him/ her. This explains the rise of personal financial management tools and software. Alternate lenders can sense a massive opportunity to provide deeply personalized financial options and then disburse the loans accordingly. With AI and big data, this advantage can be delivered at scale to consumers across the board. With the online-offline divide fast disappearing, lenders see an opportunity in enabling better personal advice and support. This goes beyond traditional avenues like phone calls or chats. Digital products like co-browsing tools and video chat enhance the degree of satisfaction delivered by support executives working for alternate lending institutions. There are several types of alternative digital lenders in the market who took over the lending business by storm. 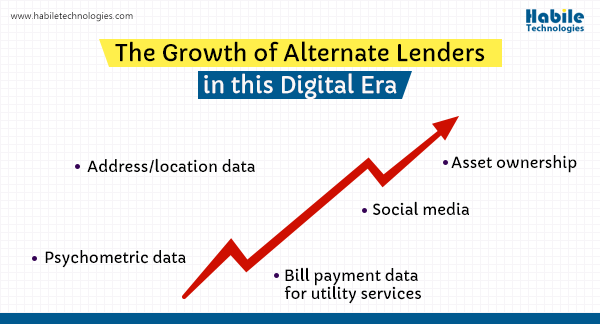 These trends aptly depict the transition from paper-based processes to re-designing the customer experience completely when they seek a loan from an alternate lender. These nimble Fintech disruptors emerge as the choice of alternate lenders in this digital era for a wide population of MSMEs and individuals.